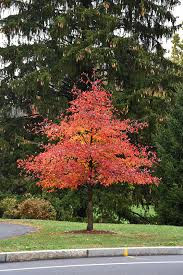 And, then next spring we'll bring in part 2 of the memorials, with the purchase of a larch tree--a twin to the larch we already have near the back patio--only this one will be going in front. Hmmm, that might be a worthwhile "retirement" project: asking people, who probably wouldn't entertain the thought themselves, if they'd like a new tree for their front or backyard. All it would take is some money, some time, some helpers and some jumping of hoops for permissions (landlords, etc). I'll have to start a list!